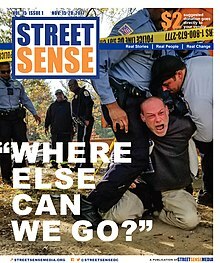 Street Sense is a bi-weekly newspaper sold by self-employed homeless distributors ("vendors") on the streets of Washington, D.C., the capital city of the United States. It is published by the 501(c)(3) nonprofit Street Sense Media, which also produces documentary filmmaking, photography, theatre, illustration and poetry. The organization says this media, most of which is created by homeless and formerly homeless people, is designed to break down stereotypes and educate the community. Street Sense Media is a member of the International Network of Street Papers. The 16-page publication features original news reporting, opinion articles and artwork focused on issues of homelessness and poverty. It is produced by a portion of the paper's vendors, volunteer freelancers, student interns and paid staff. A secondary goal of this model is to create conversation and build community between housed and unhoused people. As of 2017, Street Sense Media has over 130 active vendors distributing roughly 10,000 newspapers every two-week cycle. Ten years after it was founded as a street newspaper, the organization began expanding into multimedia content in 2013, starting with theatre. Street Sense Media’s theatre groups — Staging Hope (inter-generational) and Devising Hope (adults) — perform original works throughout the D.C. metro area, exploring themes such as love, family, grief, and personhood. The next year, the organization founded the nation’s first homeless filmmakers cooperative, a group of homeless and formerly homeless people working together to share their experience through film. The group’s first three films premiered at E St. Cinema in the spring of 2015. Two more — both directed by formerly homeless women — premiered at E St. Cinema that fall. In 2015, Street Sense Media launched a podcast, Sounds from the Street, which featured conversations with activists, policymakers and people experiencing homelessness. The organization's artists also produce photography, illustration and writing. Street Sense Media provides weekly courses, tailored for its homeless and formerly homeless vendors, in each type of media it produces. Street Sense published its first newspaper in November 2003, three months after two volunteers, Laura Thompson Osuri and Ted Henson, approached the National Coalition for the Homeless about starting a street paper in Washington, D.C.
For the first year, Street Sense operated as a project of the National Coalition, but in October 2004, the organization incorporated and moved into its own office space. In March 2005, Street Sense received 501(c)(3) status, becoming an independent nonprofit organization. By November of that year, Street Sense had formed a full board of directors and hired co-founder Laura Thompson Osuri as a full-time executive director. In June 2006, a story by one of the paper's vendors and the editor that exposed eviction companies that exploited homeless people for day labor was featured on the front page of The Wall Street Journal and led to a class-action lawsuit. In February 2007, the paper increased publication from once a month to twice a month. In January 2013, the paper increased the suggested donation amount listed on the cover of each edition to $2, and the wholesale cost to vendors, listed on the inside cover, to 50 cents per newspaper. When Street Sense was founded in 2003, the paper was sold to vendors for 25 cents per newspaper and was given to customers for a suggested donation of $1. The cost for vendors rose to 35 cents in 2009 during the Great Recession, with no adjustment of the suggested donation. In March 2015, the organization received funding to pilot an entrepreneurship program to train its homeless and formerly homeless writers to create commercial content, such as blogs, marketing e-mails and advertising copy. In May 2017, the organization hired a full-time case manager to help vendors connect with resources such as housing, employment and health care. This complimented a part-time social worker who had been hired several years beforehand. In September 2017, the organization formally rebranded from "Street Sense" to "Street Sense Media," including a new logo, color scheme and mission statement that accounts for the new multimedia content it has evolved to produce. The next month, a digital sales application was launched to enable credit card purchases of the paper on mobile devices. ^ "Street Sense gives homeless creative tools to build careers and help others". PBS NewsHour. Retrieved 2018-07-09. ^ "In Our Backyard Interview: "Homelessness is Like Being Slowly Disassembled" - Talk Poverty". Talk Poverty. 2015-01-15. Retrieved 2018-07-09. ^ "Our Street Papers". INSP. Retrieved 2018-07-05. ^ "Street Sense PDF Archives". Issuu.com. 2003-11-15. Retrieved 2018-07-09. ^ Keiper, Caitrin (2014-04-01). "Spring 2014 - Nonprofit Spotlight: Street Sense". Philanthrohpy Magazine. Retrieved 2018-07-09. ^ "Become a Vendor". Street Sense Media. Retrieved 2018-07-09. ^ "Street Sense Takes the Stage". Washington Free Beacon. 2013-08-28. Retrieved 2018-07-09. ^ "Remembering Elizabeth Kitsos-Kang, who "made people into artists and artists into people"". DC Theatre Scene. 2018-06-30. Retrieved 2018-07-18. ^ "Street Sense performances showcase struggles of homelessness". The GW Hatchet. 2014-11-23. Retrieved 2018-07-18. ^ "Homeless filmmakers prepare for prime time | WTOP". WTOP. 2014-10-31. Retrieved 2018-07-09. ^ "In D.C., Homeless Filmmakers Tell Stories from the Street". CityLab. Retrieved 2018-07-09. ^ Petula., Dvorak (August 24, 2015). "A life filled with wrong turns leads to a moving chronicle of homelessness". Washington Post. Retrieved 2018-07-09. ^ Myers, Aaron (2017-11-15). "Street Sense Pop-Up: Photography in Action". The District NOW. Retrieved 2018-07-18. ^ DeMarco, Lauren (2016-09-30). "DC homeless show off their artistic side at Street Sense's District of Art celebration". Fox 5 DC. Retrieved 2018-07-18. ^ Selyukh, Alina (2014-05-23). "Obama writes to homeless poet on "Commentary to a Black Man"". Reuters. Retrieved 2018-07-18. ^ Johnson, Richard (2015-09-25). "Drawing the invisible". The Washington Post. Retrieved 2018-07-18. ^ Mazzucca, Tim (2003-11-13). "Area homeless to inject Street Sense into media picture". Washington Business Journal. Retrieved 2018-07-18. ^ Phillips, Michael (2006-06-30). "Homeless Reporter Gets Job, and Story, Evicting Others". The Wall Street Journal. Retrieved 2018-07-18. ^ Harley, Chantel (2007-02-08). "For Homeless Staff, A Paper's Big News". The Washington Post. ISSN 0190-8286. Retrieved 2018-07-09. ^ Gilbert, Sophie (2013-01-03). ""Street Sense" Now Costs $2". Washingtonian. Retrieved 2018-07-18. ^ Clozel, Lalita (2015-06-03). "How Digital Hope is helping homeless writers make it online". Technical.ly DC. Retrieved 2018-07-18. ^ Gilchrist, Alison (2015-11-19). "Street Sense social worker celebrated for work empowering homeless vendors". INSP. Retrieved 2018-07-18. ^ Schneider, Drew (2017-09-22). "Street Sense gets a new look, and new vests to help you find them". Petworth News. Retrieved 2018-07-18. ^ "As People Stop Carrying Cash, The Street Sense Newspaper Pioneers Digital Payments". DCist. Retrieved 2018-07-09. Newspapers published in Washington, D.C.